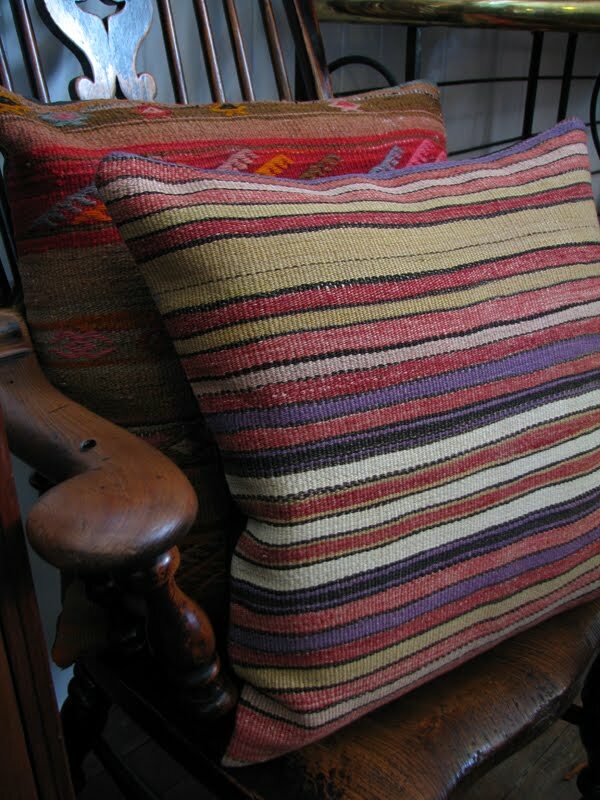 We have just had a gorgeous selection of antique Kilim cushions come in to the store, some of which are above stacked on our early Indian trunk. Each one is different and has its own story. 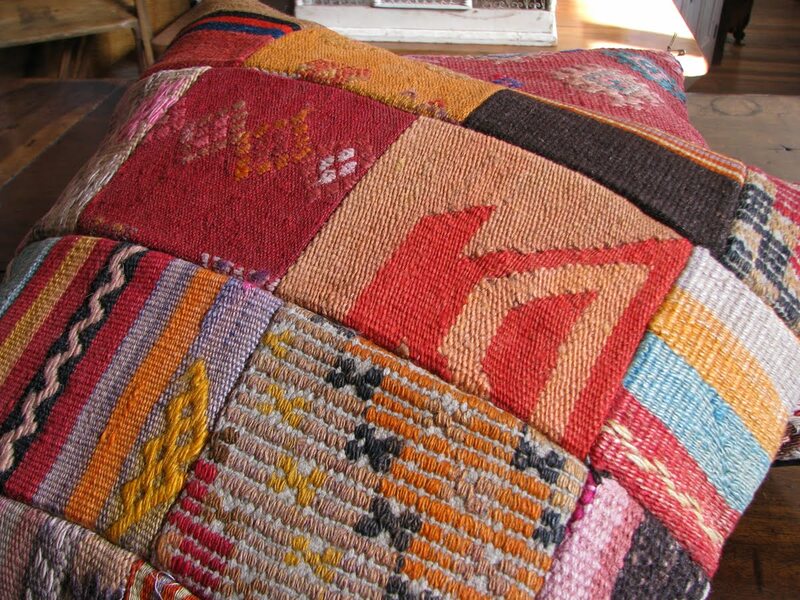 Kilims are flat weave tapestries as opposed to carpets which have a pile. 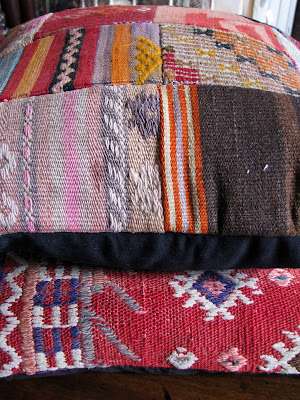 It is for this reason kilims are more fragile than carpets which have pile to protect the weave from wear. 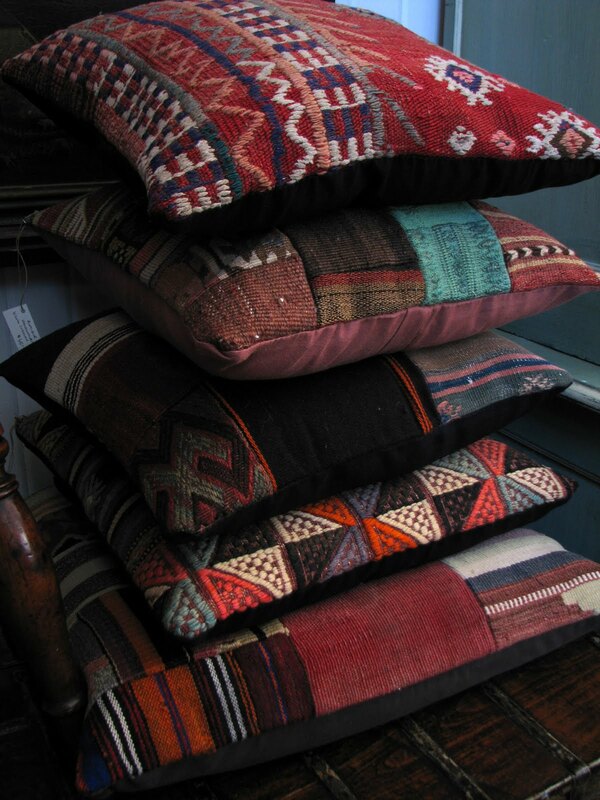 The kilims used for these cushions originate in Turkey and are mostly wool. They were either made for decorative purposes e.g. as wall hangings or to use as floor rugs, horse saddles, bed covers etc. I am particularly fond of the patchwork style cushions where pieces from various kilims are sewn together. 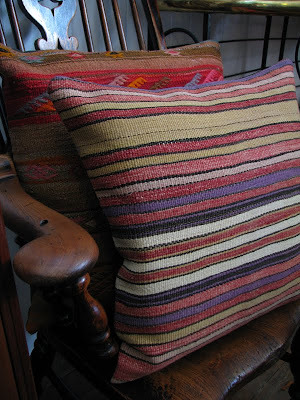 This striped example is sitting on an English broad arm Windsor chair. The colours would certainly help to brighten a dull couch! Hope you're having a great Sunday! Taking a break from mowing the lawns on this fine day. Love the Turkish Kilm cushions and I can just visualise these on a moustache backed leather chair. (Don't think I have called the chairs correctly, but hope you know what I mean). My two favourites are the one in the first picture and the patchwork one. I think I have a cushion addiction! I also think these cushions would never date. 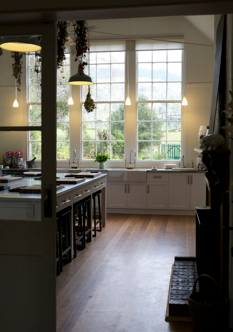 There's something really classical about them. Thanks for sharing. Back to the lawns. I always enjoy calling back in and the appreciation runs both ways. Love that you leave a reply. 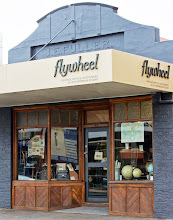 I hope sooner than later, that I can visit your gorgeous store and we can meet in person. Have a great week. Thanks Tammy.